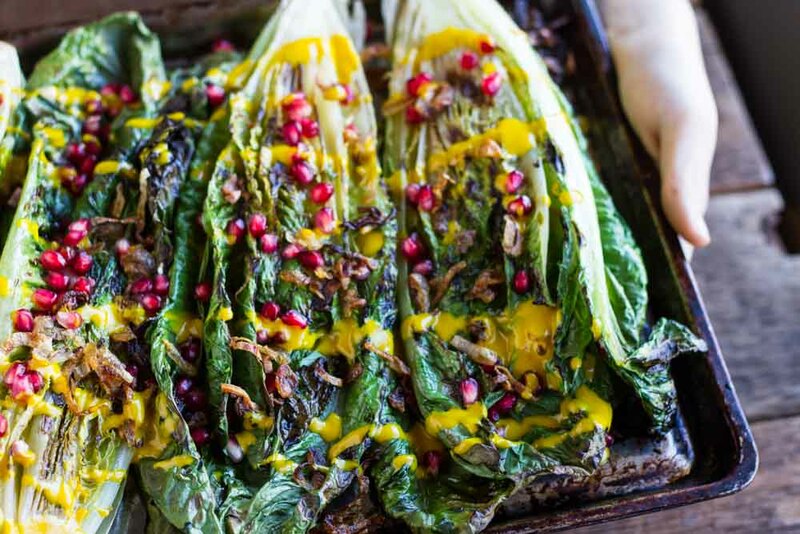 Fresh heads of crispy romain lettuce beautifully charred on the grill, drizzled with creamy turmeric dressing, and topped with pomegranates and crispy shallots. Presenting my version of the grilled romaine salad. You guys, THIS is one of the bests salads that I have EVER had. And I am super excited to share it with you today. I’ve never actually had grilled salad before. I’ve seen it at restaurants and on Pinterest, and I thought it was about time gave it a try. I am SO happy that I did. 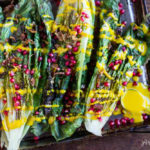 Last week, I shared with you all some amazing Fall Salad Recipes. Even though it’s officially soup and slow cooker season, I still like to get my salad greens in. So today I am back to share the perfect cool weather salad with you all. Isn’t it beautiful? 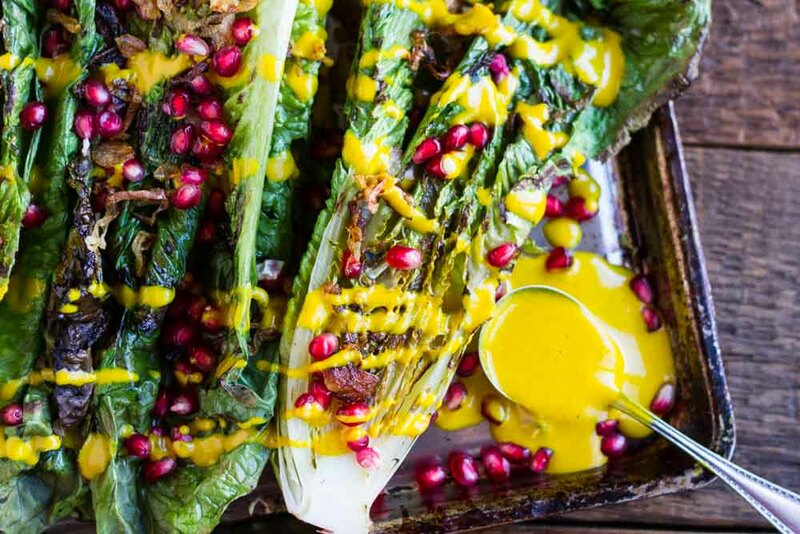 I love everything about this grilled romaine salad. 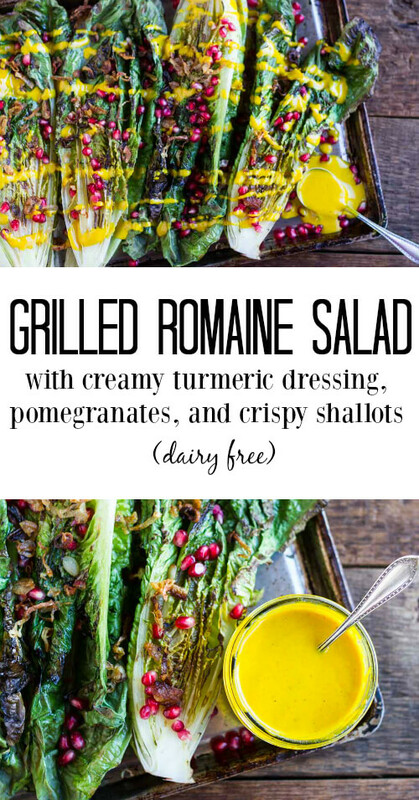 The grilled romaine is surprisingly delicious. 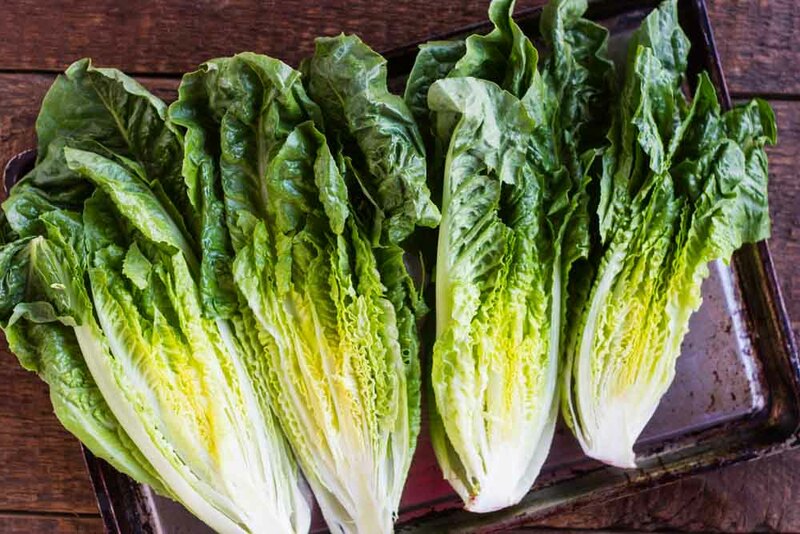 You may never eat raw romaine again! 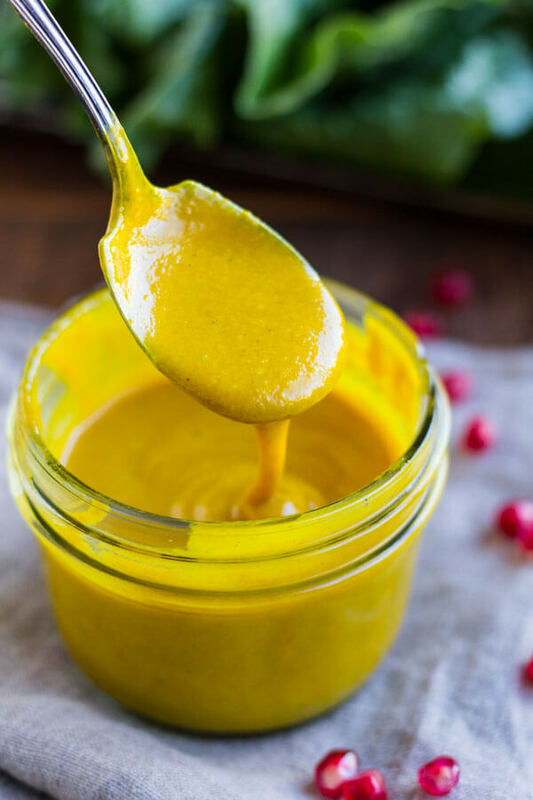 The creamy turmeric dressing is perfect for this time of year and loaded with all sorts of cool health benefits. The savory crispy shallots and juicy sweet pomegranates are the icing on the cake and create a fantastic flavor explosion in the mouth. Need I say more? You may have noticed that I’m on a little bit of a turmeric kick right now. I’ve been eating Golden Milk Chia Pudding and drinking warm Golden Milk to help keep inflammation down in my body as I continue on my healing journey. It has become part of my self-care routine. 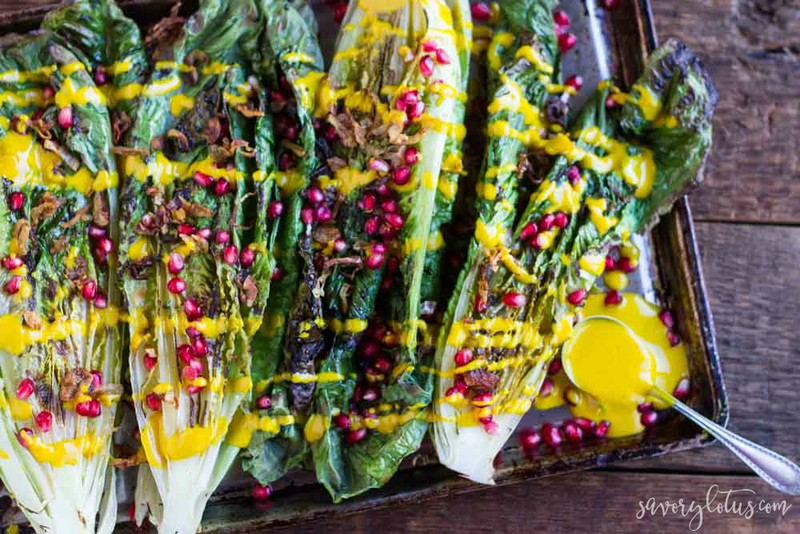 I use roasted tahini for this recipe as I prefer the taste. It’s a bit smoother. 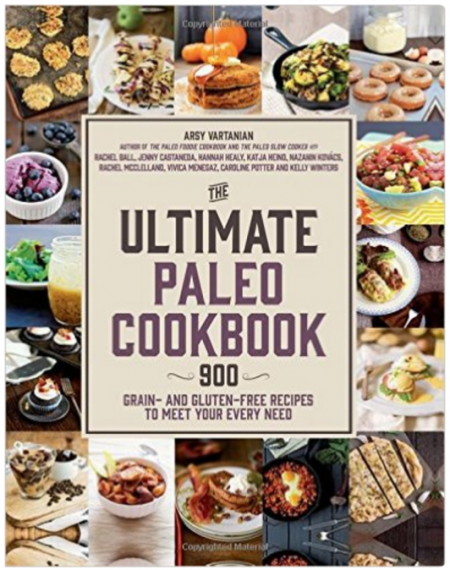 You can also use raw tahini if that’s what you have. Do not skip the crispy shallots. 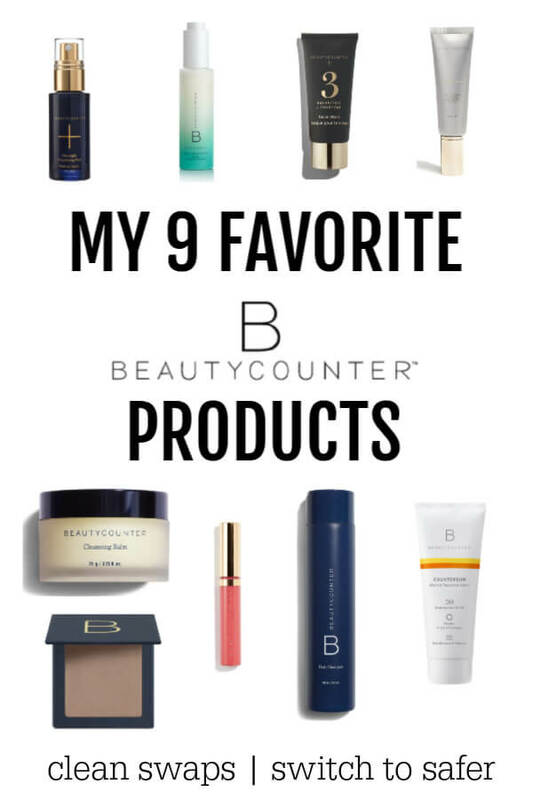 If you have not tried them, you are in for an incredible treat. Serious goodness. I also use them on my Beet Tartare. You’ll notice that I use the oil for making the crispy shallots in the dressing. This gives it an amazing flavor. If you prefer not to do so, feel free to just an extra 2 tablespoons of olive oil in the recipe. This amazing salad raises the bar on salads for me. I’m thinking that it would be the perfect salad to impress your holiday dinner guests. Let me know if you give it a try. Have a positive rest of your day! Slice romaine heads in half lengthwise, rinse, and dry. Place onto baking sheet and brush liberally with avocado oil. Set aside. Remove seeds from pomegranate. Set aside. TO MAKE CRISPY SHALLOTS: In a medium skillet, heat ¼ cup of avocado oil on medium-high heat. Saute sliced shallots in hot oil until crispy and brown, stirring occasionally, about 7-8 minutes. Then using a fine mesh sieve over a bowl, carefully pour oil and crispy shallots though to strain out the oil. Allow crispy shallots to drain on a paper towel while you prepare rest of recipe. TO MAKE DRESSING: Combine all ingredients in a small bowl and whisk until creamy smooth. Adjust for lemon, salt, and pepper. Set aside. 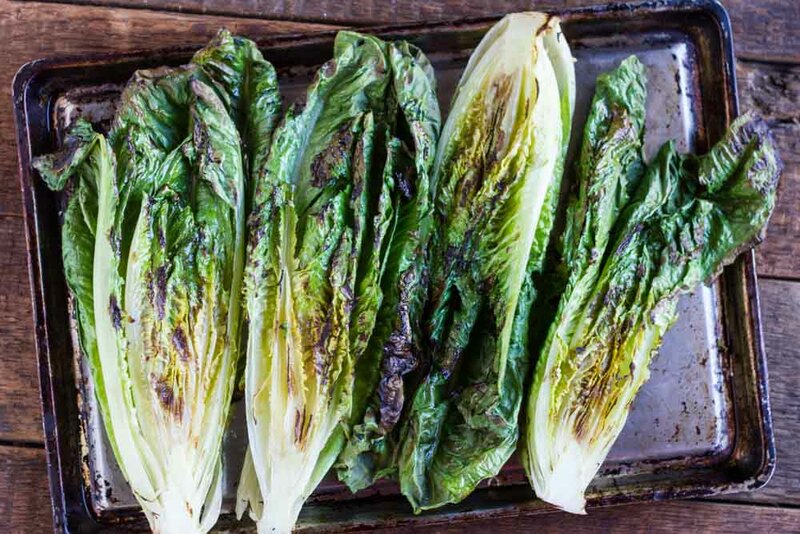 TO GRILL ROMAINE: Preheat grill on high heat. 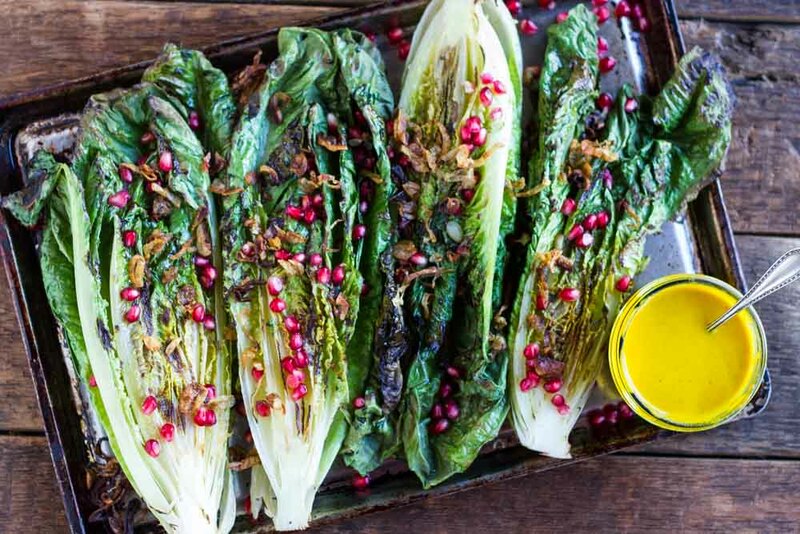 Place oiled romaine halves onto hot grill grates for 2-3 minutes each side or until they have nice dark grill marks. 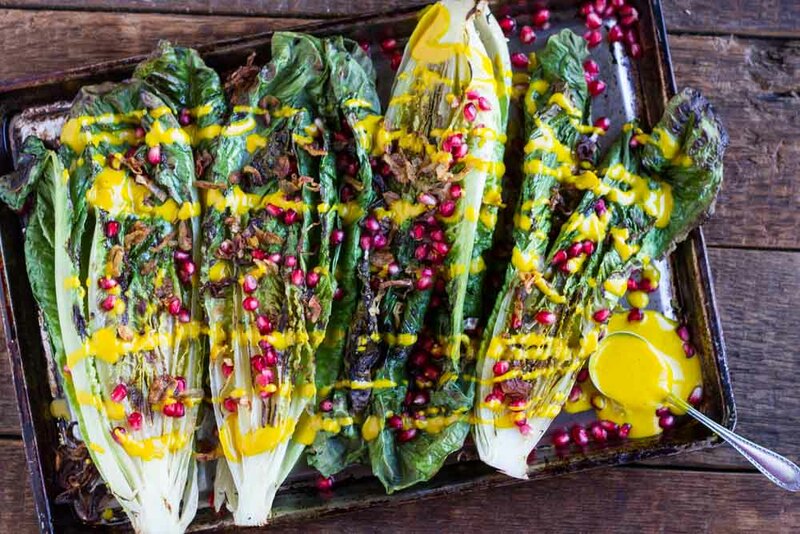 Arrange grilled romaine heads onto serving plates. 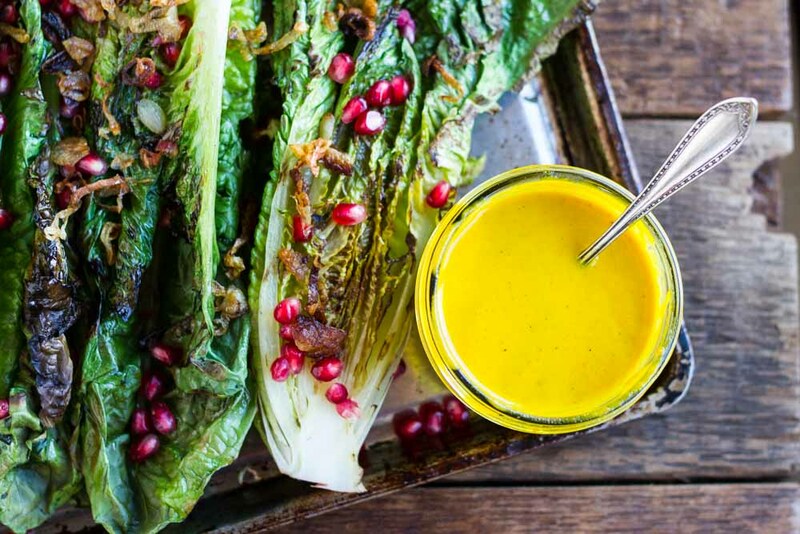 Drizzle with creamy turmeric dressing and garnish with pomegranates and crispy shallots. Serve immediately. Enjoy! This looks amazing! I plan to try it soon but what measurement do you use for the turmeric? Tbsp, I imagine? Thanks for the great recipes! Hi, Suzanne! It’s 1 and 1/2 teaspoons of turmeric powder. Sorry about that. It’s fixed now. 😉 Let me know what you think if you try it. ON the ingredients list it says 2 heads romaine under the dressing as well… is this true? Thanks!